On the 70th birthday of the Fonz (aka Henry Winkler), commodities are trying to stay cool amid a bearish barrage of news. We have had Q3 earnings from Exxon Mobil and Chevron to round out big oil’s reporting; both fell in lockstep with the trend of the other members – falling profits but strong downstream performance. Chevron’s net income fell to $2.04 billion (from $5.59 billion a year ago), while Exxon posted a $4.24 billion profit, compared to $8.07 billion in Q3 of last year. Onto economic news flow, and Japanese data were disappointing, as inflation evaporated to zero (hark, below) for the first time since mid-2013. Household spending came in exceptionally weak, housing starts were poor, while unemployment remained at 3.4 percent. Finally, the Bank of Japan not surprisingly maintained the status quo and kept interest rates at 0.1 percent. Across to Europe, and German retail sales disappointed, flat for last month, and +3.4 percent YoY (vs. +4.2 percent expected). French consumer spending was also flat as a pancake crepe, while preliminary Spanish Q3 GDP was in line with consensus at +0.8 percent (QoQ). Inflation for the Eurozone matched Japan by being errant (0.0 percent YoY), while the unemployment rate surprisingly dropped 0.2 percent to 10.8 percent, the lowest since April 2012. In terms of U.S. releases, both personal income and spending disappointed, while the PCE price index (a measure of inflation) was the same as last month at +1.3 percent YoY. 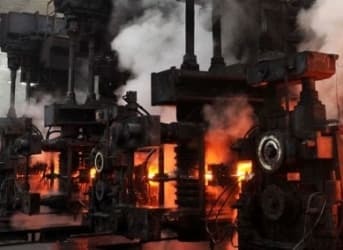 Earlier in the week we discussed how the head of China’s steel industry highlighted how Chinese demand is slumping at an unprecedented pace. The chart below shows how Chinese exports are reaching a record level, as this domestic demand drops off. Lest we forget, China is the world’s largest steel consumer (hark, 45 percent of total global consumption), hence such demand weakness is a huge red flag for the state of the Chinese economy, and does not bode well for oil demand going forward. A theme of weak demand is prevalent in the Chinese LNG market also, as recent data shows Chinese LNG imports have fallen 3.5 percent so far this year, compared with a 10 percent rise in 2014. LNG currently accounts for 5 percent of China’s total energy mix, with a target of 10 percent by 2020. Related: Why Do Oil Companies Manage Their Own Logistics? It is incredible to see how low current Asian natural gas prices are (below $7/MMBtu), after being as high as $20 early last year (hark, below), while projections for the coming years point to further lower prices – in Asia and Europe alike. The oversupplied nature of the global LNG market is going to resemble the current crude market; lop-sided to say the least.